I was so excited that androoo brought out his incredible Kyosho SE30 this week so I could do a #twinning face off with him once again. If you missed it, stop reading my post and go check it out. 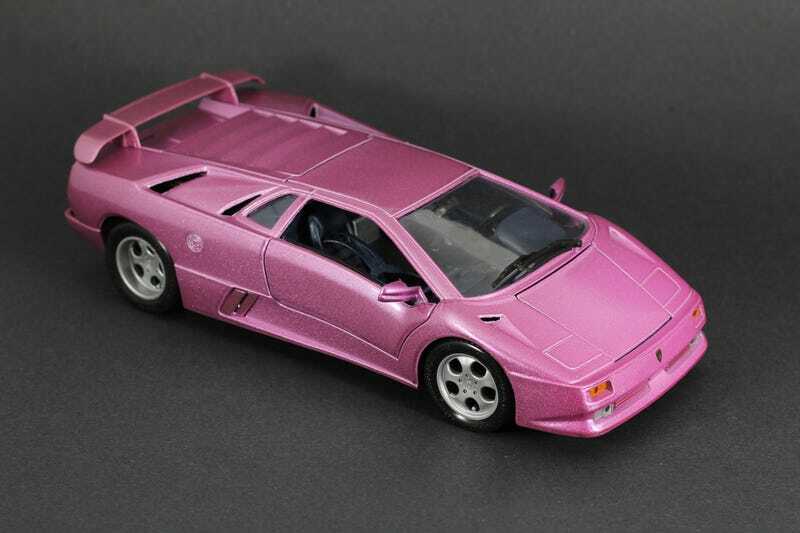 Really the only difference I can see between his model and my own is that his is the top-of-the-line Jota while mine is the standard SE30 Diablo. I’m just messing with you guys of course, but its really amazing to see the difference between these two models. His is the state of the art, high-end detailed, resin Kyosho. Mine is a 25 year old low end budget diecast model. Its legit an antique. Who am I fooling! Androoo’s model is just plain AMAZING!!!!!! Mine’s an ancient Maisto, its exactly what you expect. Sure the parts open, like the scissor doors, only to reveal door sills that were just kissed with a bit of paint overspray. Those are some seriously stickertastic gauges on the dash. There’s mounting posts galore, sticker badges, and crazy uneven panel gaps. I mean... I guess that IS authentic early 90's Lamborghini right? Talk about your restrictive exhaust systems! And Maisto’s not fooling anyone with those sticker lenses on the rear bumper. All joking and bashing aside, this thing is pretty sweet considering its age. Everything opens and stays propped up! That incredible V12 powerplant in the back is surprisingly detailed. I do prefer the look of the standard SE30's fully lourvered rear hatch as opposed to the Jota’s double snorkel air intake.